Aerie, despite her small and slight stature, is actually quite the heavy hitter in a fight. She specializes in a type of scythe which she helped to create herself- resulting in a very extensive knowledge of her weapon and what it can do. Usually, she relies on her strength and speed- hitting hard and fast in hopes that her enemy won’t have much of a chance to hit her back, since she knows she isn’t the best at taking hits. With her speed comes rather good agility too though, and she uses that to her advantage to try and avoid getting hit. Mostly, she uses the sharp blade of the scythe to cause chaos amidst her enemies, while using the powerful rifle built in to either speed up her attacks or simply to shoot at whoever she’s trying to hit. 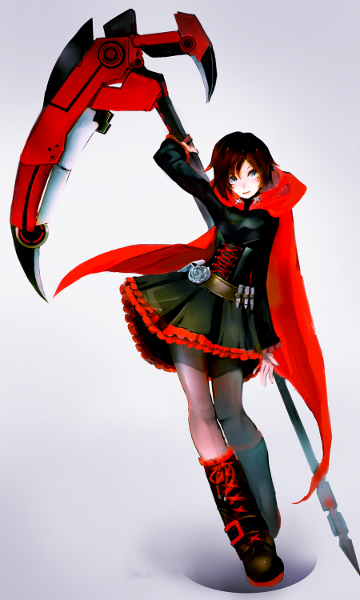 Overall, she’s small and light on her feet, hitting harder than would be expected of a girl her age- especially when using her scythe, which she can wield expertly. In addition to her extensive scythe wielding knowledge, Aerie is capable of using very small amounts of magic. 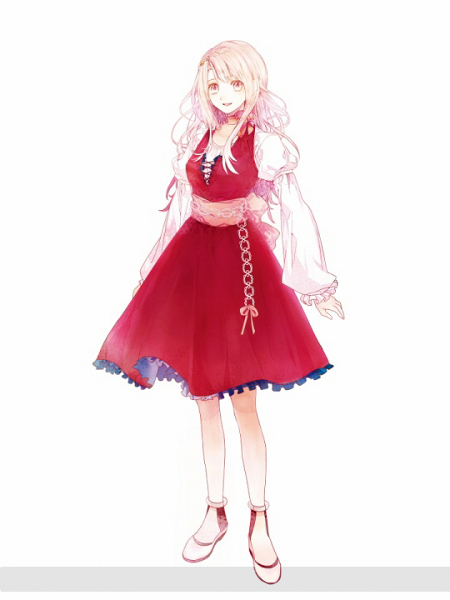 These generally revolve around roses - she is capable of summoning rose petals to do a few things, even short bursts of teleportation thought not incredibly far. Aerie was largely self trained until she ran into the man who offered to be her mentor, and then she underwent intensive training on the usage of her scythe and the identification and best ways to kill monsters. She's practically a monster fact encyclopedia, thanks to her time with her mentor. Aerie is motivated largely by her past experiences and the pain caused by certain events in her past. She doesn’t want anyone to have to experience what she did when she was younger, and so she works to defeat any monsters she finds, protecting innocent families from harm. One of her biggest dreams is to one day be able to live without worry- to see any children she may or may not have living in a world where they don’t have to fear. Quite simply, she wants to see the world with less dangers and threats. On top of this, however, Aerie is somewhat surprisingly terrified of monsters. They took out her family, hell her entire town, in a single night- and she’s terrified that if she dies, it will be at the hands, or jaws, of a creature of the night. 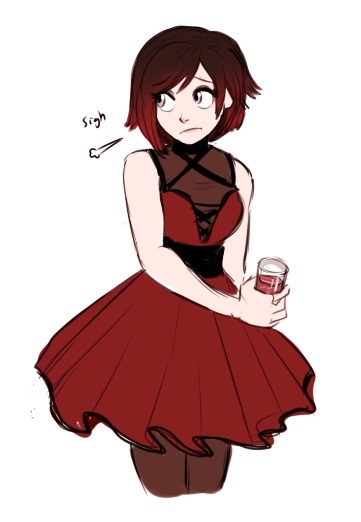 She’s also somewhat scared that her work won’t be enough to save everyone- every day, more lives are lost, and she hates feeling as if she’s fighting an uphill battle- worst case scenario, she’s afraid the monsters will overrun the world without her there to stop them. Most especially though, she fears something will happen to her sister. She writes her letters as often as possible to keep in touch while she’s traveling, worrying and fretting constantly. Her sister is the only family she has left- and they made it through so much, she’s afraid of losing her. Aerie was born and raised in a small town, living with both her parents and her two younger siblings- a brother and a sister. They were a rather happy family for quite some time, even though they lived on the outskirts of town and kept a bit to themselves. Yet nothing lasts forever- during the summer she turned twelve, Aerie’s life changed drastically. One night while most of the town was already asleep, a rogue pack of werewolves, already changed by the full moon, happened upon the town. Aerie, asleep in her bed, was awakened by the howls and screams as the beasts fell upon the helpless townspeople. Her parents had gone to wake up her younger siblings first, desperate to escape the carnage, yet by the time they succeeded in getting all three children awake and ready to leave- the wolves had reached their house. Her father was the first to die- he tried frantically to fend the wolves off while Aerie and her mother and siblings tried to escape out the back exit. But there was no chance… the beasts killed the father near instantly and moved on, crowding into the house. The next to fall to the jaws of the beast was her younger brother- keeping track of three young children in the midst of a panic is no easy job, and Aerie’s mother fell behind on herding the young boy along for only a split second- just long enough for him to be snatched up and devoured by the creatures. Already, two of the family of five had died- and they were running out of chances. Before long, wolves made their way through the back door as well, trapping the remaining three in the house. Her mother, knowing they could no longer escape the house, went for the next best thing- the cellar. There was an entrance hidden in the floor boards, and if they could just get there then they’d be safe- wolves had no hands, after all, and couldn’t lift the door of the hatch. Aerie and her younger sister made it. Her mother, however- did not. They had just reached the cellar and she’d ushered the two children inside when a wolf bit into her leg- and she knew she wouldn’t escape. In a last desperate effort to save her children, she slammed the door shut and allowed herself to be dragged off by the wolves, her screams echoing throughout the house. When morning finally crept over the destroyed household, Aerie and her sister were afraid to risk venturing out- yet legends said that werewolves returned to human once the moon set beneath the horizon. Knowing this, the pair of girls slowly allowed their feet to carry them out of the cellar… and the sight they saw once they reached the rest of the house would forever be burned into their memories. The entire town was in ruins. Nary a soul remained, not even a chicken- puddles of blood had collected on the ground in the streets, where the dirt had absorbed all it could yet still, excess remained. They were the last two survivors from their town after that attack, and they’d be forever changed by that. Aerie was forced to take care of her sister. They both had to learn to survive on their own, and more importantly, they had to escape from the territory of those werewolves. They moved into a bigger city, found a place on the outskirts, and settled in, even were sort of adopted by a kind city guard- yet nothing was the same. Aerie would often slip off, leaving her sister in the hands of the school teachers and their adoptive parent, while she herself trained to fight. She wanted to avenge her family, her townspeople- and the only way she could think of to do so is by training herself to hunt down the type of people that had killed them. Werewolves- but not just them. Monsters- monsters of any kind, any breed. One day, while practicing, a man appeared from the trees, speaking of destiny and hope and some sort of change in the air- what seemed, at the time, to be nonsense- yet when pressed for more clear answers, he suddenly offered to help her train. Aerie, though cautious, knew she couldn’t learn everything herself… so she agreed. They worked together for a good while, with him helping her to learn new techniques- and even helping her make her current weapon, which is actually quite frightening. Slowly, they grew closer, and Aerie almost started to see the man as a fatherly figure… but it seemed that even that wasn’t fated to last. While out on a job, the pair of them ran into a rather startling surprise- a vampire. Not one they had been hired to take out, either. Unprepared with the proper tools to try and eliminate the ‘monster’, they decide to try a different tactic- trickery. The pair approached the vampire, pretending to merely be travelers, putting on an act to try and fool him into trusting him… and it worked. They introduced themselves, learning the stranger’s name- Lonan Darcy- and slowly plotting how they would take him out. Before they could even start to implement their plan, however, something happened. Something neither of them was expecting, which changed everything. Her mentor, while whittling wood- coincidentally, into a stake- cut his finger. As blood started to well up, he thought nothing of it- yet the vampire had noticed. Little did they know, it had been some time since he’d eaten… and before anyone could move, he fell upon the man, bloodlust driving him into a frenzy. By the time Aerie had managed to grab hold of her scythe- her mentor was dead. Traumatized by what she’d just witnessed and furious that she’d once more been helpless to save someone she cared for, Aerie attacked instantly. The two engaged in a fierce battle, Lonan tossing spells and calling upon crows to attack her while she relied largely upon her scythe, trying quite simply to cut him into bits. Both were desperate to win, and neither seemed to be succeeding- yet before their fight could truly end, a man with dark wings suddenly swooped through, grabbing up the vampire and flying away. Aerie tried to give chase, wanting to avenge her mentor, but wings travel much faster than feet. She lost them both- yet she had a name, and her training, alongside a fiery passion. She was determined to see that man dead for what he’d done- and to this day, she still hunts him, amidst all the other monsters she kills on the side. -She carries a cross to try and chase Lonan away. It has seemingly yet to work right. Eliah is able to use healing magic due to his angelic nature. Calling on remnants of his holy magic, Eliah is able to summon a sort of tainted magic that manifests as dark flames which he can use offensively. Eliah has learned through many years of existence and from many different tutors the ways of using dual swords to fight and has since then adapted his inherent angelic power to fight any who challenge him. Eliyah wants to feel needed. It’s an old, deep set desire from back when he was a guardian angel- the people he looked over needed his help and guidance, and though he’s been banished, the craving for that feeling still lingers. Otherwise, there’s not much he really wants to do- except, of course, take part in plenty of the sins that he was unable to before. It seems he never gets tired of that. It’s as if he wants to punish Heaven for what they did to him, yet… Although he’ll never admit it, there is a deep, secret desire for a chance to return to Heaven. He was banished upon someone else’s trickery, and though he was to blame for falling for it, he still feels that he may have a chance, if he makes up for his sins, to regain his previous status. He’s not actively trying for this though- finding much more entertainment in causing havoc around with the people of the land. However, as an angel, one of the biggest things you fear is being banished from Heaven. Sadly for Eliyah, that’s already happened- yet there are still things he’s afraid of. He’s absolutely, positively terrified of losing his wings- they’re one of the last, important connections he still has with his old life, with the Paradise he was driven from. Despite having fallen, he’s also a stickler for hygiene and cleanliness (even if he went through a period where it seemed not to matter to him)- so any person, place, or thing that’s dirty will send him cringing away, trying to avoid physical contact. Of course, his view was clouded. He’d grown so tired of everyone being the same, boring, mundane people- when a genuinely pretty woman came to him as a ward, well- he was head over heels, practically. He convinced himself he was in love with this woman, and that they could live happily- but for anything to happen, she needed to know he existed. He needed to reveal himself to her, to a human. He knew this was against the rules yet he took the chance- and just as he’d hoped, the woman accepted him. Who wouldn’t accept an angel, after all? He knew he had to keep his actions a secret though, and so it was rough on the both of them. Despite the difficulties, the pair dated for a surprising amount of time. The woman even took many ‘firsts’ from Eliah- which he nowadays refuses to admit to, of course. Yet… not all good things have a happy ending. 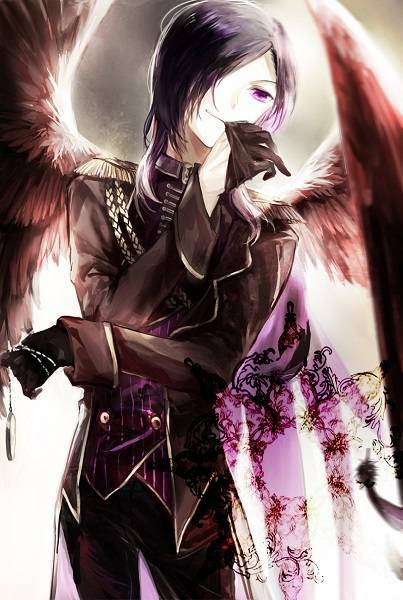 Their relations were discovered not by a fellow angel… but by a fallen angel- the very first fallen angel himself. Lucifer. This man saw potential in Eliah- and so, he plotted. He planned and he schemed and at last when he had figured out what he was going to do he took up the illusion of being an actual angel, and he spoke to Eliah. He told him that in order to be redeemed and forgiven for his sins, for consorting with a human as he had, he would have to kill this human- so she would never have the chance of spilling their secret. Terrified of being expelled from heaven, Eliah obeyed the man’s directions. He killed the woman that he had thought he loved oh so much- and then Lucifer sprung his plan. The true angels of heaven found out about what Eliah had done- and without so much as a single question, they banished him from Paradise. Eliah was heartbroken. Not only had he killed his lover, but he’d been deceived by the devil and banned from heaven. He was homeless, lonely, and confused. What was he supposed to do after his entire world had changed? Somehow… he made it through. He pulled himself together, blending into the human society as best he could given the circumstances. He learned he had the ability, as a fallen angel, to hide his wings if he so wished and often would do that- seeing the once ivory feathers darkened to a near raven’s shade of black was a painful reminder of something he, at the time, wanted to forget. Eliah wandered the land for centuries by himself, at first with nothing to do- but as time progressed, he got into doing various odd jobs. City guard, mercenary, hell- he even did the hitman gig for a while. Nothing really settled with him though… he kept switching jobs up until the point where he met Lonan, finding the man alone and injured in a small, cramped cave- avoiding the sunlight. Of course, Eliah could tell what he was- yet it had been so long since he’d fallen and he was so… tired, really, of obeying how people told him to act- well, he set about to nursing the other back to health right away. They’ve been traveling together since- both of them sort of covering for the other’s weaknesses. 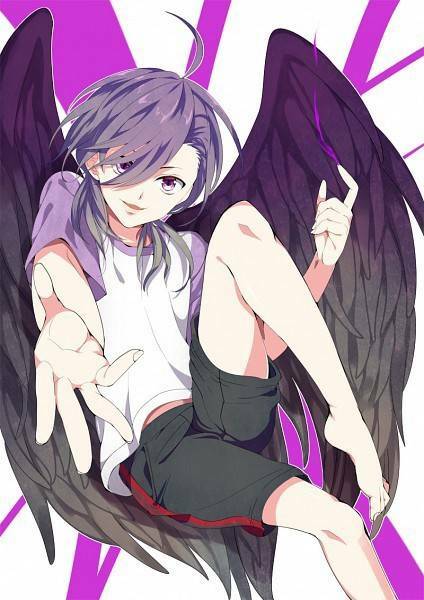 -Despite being a fallen angel, he still has and can use his wings- the main difference since he fell is the color. Before, they were white and pure, but now they’re a purplish black that ‘shows the taint in his soul’. Auryon can somewhat use a knife but really doesn't know how to fight with it. Other than that, she seems to have an adept sense of magic and can usually tell when it's being used nearby - but that's it. Auryon is an extremely talented magic user. She has the ability to tap into vast stores of elemental power and use it to her advantage - yet she's yet to be trained on how to do this. At most, she could tap into something - but uncontrolled, it would destroy not only everything around her but herself as well. With that in mind, she is only capable of using small amounts of magic in different elements - her best are fire and water, followed by earth and light, with her worst being air. Any other elements have yet to be touched upon by her teachers and she dares not attempt to use them without proper training - lest she end up getting herself killed. Auryon was trained in a private academy that operates under very secretive covers. She was taken from her home town when she came of age by the headmistress of the academy, an exceedingly talented sorceress by the name of Mistress Atwood. That woman trained her for a year or so before Auryon begged for permission to travel and learn from the world - and to her shock, Mistress Atwood agreed. Vehicle: She has a horse. Auryon was born the eldest child to a rather normal family. She grew up like most kids, helping out and doing chores, waiting for the year where she'd get to go through her coming of age ritual. When that day finally came, though, it didn't go as planned. Every year, a strange teacher came to take away a pair of students, to train them in the art of magic - and when Auryon came of age, she was chosen. She traveled away from home with only one friend, training at the prestigious private academy that Mistress Atwood led. She stayed there for some time, before realizing that she wanted to see more of the world - and after much begging and testing, Mistress Atwood let her. Now, Auryon has left in search of a way to learn more and help others, and her journey is only just beginning. Inspirations: I don't remember, she was made for an original story at first. -She cares for her horse a lot and has named her Priscilla with a nickname of Pris.